What to do when you have loose stools (diarrhea) during radiation treatment. What to do when you are experiencing hair loss during radiation treatment. What to do when your mouth or throat hurts during radiation treatment. What to do when you feel sick to your stomach during radiation treatment. What men can do about changes in sexuality and fertility during radiation treatment. What women can do about changes in sexuality and fertility during radiation treatment. 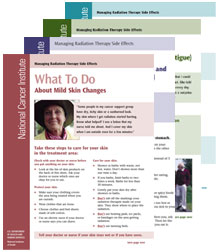 What to do when you are experiencing mild skin changes during radiation treatment. What to do about changes when you urinate during radiation treatment. What to do when you feel weak or tired (fatigue) during radiation treatment.